John Lasher, Executive Director of the Community Foundation of Warren County and Bob Crowley, Board Member, recently presented a check for $4462.81 to Dr. Patricia Hawley, Director of Student Services for the Warren County School District. 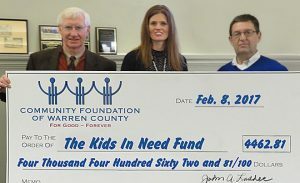 The check, drawn from the Kids In Need Fund at the Community Foundation, was used to pay for Christmas gifts for students in the Warren County School District. For years the School District staff and teachers have worked to try to provide Christmas gifts for students. In 2015, a group of local philanthropists learned of the plight of homeless students in the district and started a fund to benefit them. The fund was named the Kids In Need Fund. Information about the Warren County School District may be found at the District’s website: wcsdpa.org. Tax deductible gifts to the Kids In Need fund may be made by check payable to the Community Foundation of Warren County listing the Kids In Need Fund as the recipient of the donation. Cash contributions to the Fund are accepted at the Foundation Office at 310 Second Avenue Warren. For more information about the Kids In Need Fund or other Community Foundation programs supporting our Warren County Students contact the Community Foundation of Warren County at 814 726-9553, or visit us at 310 Second Avenue in Warren.